Equities start the day lower on the 30th Anniversary of the Great Crash of 1987! We actually have four people on our trading desk who worked that fateful event so we spent the better part of the morning sitting around a campfire hearing tales of “phone calls” (lol a phone, how archaic) and how bid / offers were nonexistent. Apparently volume doubled that day to a whopping 600m shares (lol SPY does 35mm by itself on a random Tuesday) and no one went home, they just slept under their quotron (lol quotron). The 500 pt drop would only be 2.2% in this day and age and I’m sure there’s a bunch of people rooting for a SLIVER of that volatility to return to this market. Hey, what lesson should we have learned from the Crash of 87? You ready for some folksy wisdom here? Nothing. There is no lesson to be learned. Markets crash, that’s one of their features. We know that, on average, markets fall 20% every 3 to 5 years so don’t be surprised when something bad happens again. What about valuation? Everyone uses valuation nowadays to scare people and tell us how we should all be perma bears. 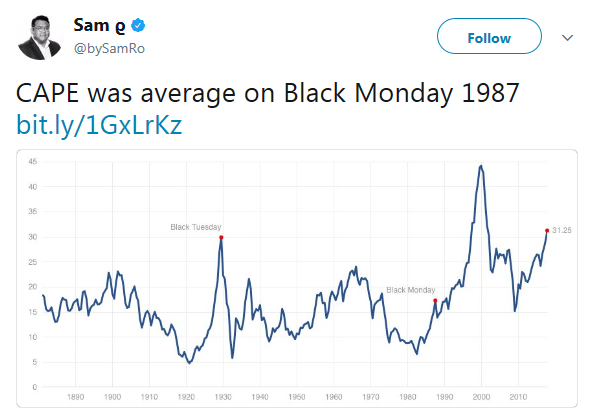 @bySamro points out that on Black Monday CAPE was average. AVERAGE. Take that valuation mongers. 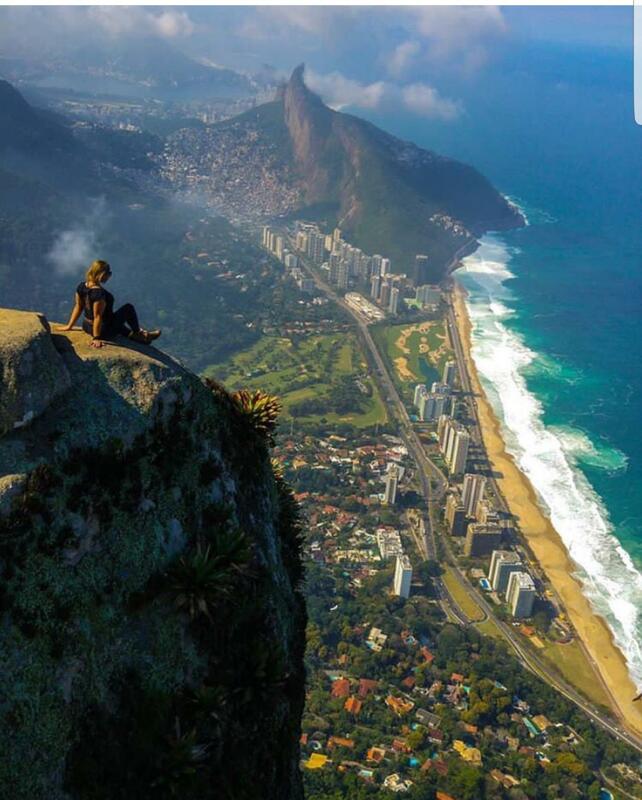 Say….imagine you bought the DJIA the Friday before the crash, what a disaster right? I’m guessing by Monday’s close you were kicking your David Hasselhoff doll and refusing to watch any of the 5 channels you got on cable. 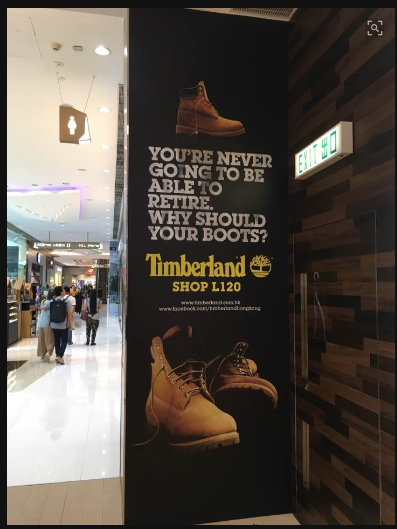 But guess what, you’d be sitting on a 10 bagger right now. You hear me? A 10 bagger. Look, there’s no doubt that the events of Oct 19, 1987 were scary to those involved and to the country as a whole but here in the year of our Lord 2017 we know that our behavior in markets is far more important than anything else. Markets go up, they go down, they go sideways, and every now and then they make everyone scared as heck. 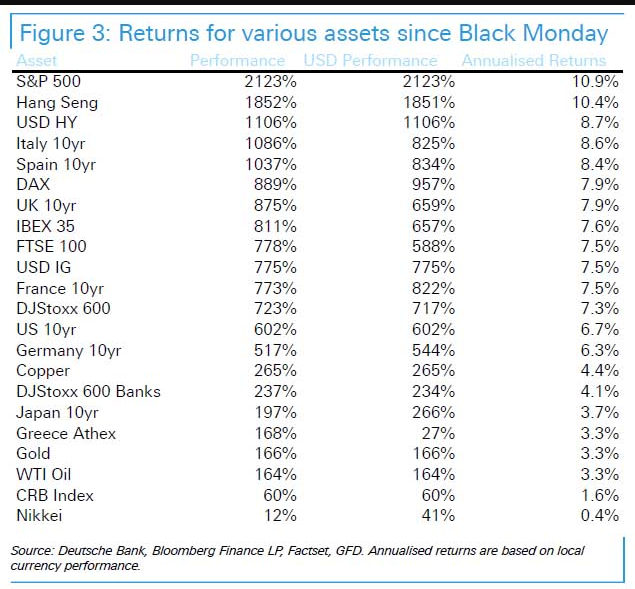 That’s the price you pay for your equity risk premium because returns aren’t free my friends. How old was I in 1987? 14. What was I doing that day? Watching Top Gun for the 856th time. After the open investors grappled with the great 90 min correction of October 2017, a vicious 0.5% drop as global tensions percolated. The fear was palpable my friends, like the Death Star peeking over the horizon. Catalonia, whispers of the ’87 crash, an overnight drop in the Hang Seng, $AAPL saying no one is buying the iPhone 8, the stories were stacked against ever present bulls. But something happened, a cheer rose from the crowd as the market inexorably moved higher. Down 40bps, down 30bps, the correction withered under relentless optimism about earnings growth and global PMIs. T shirts were printed, stories were told, badges of honor were earned. “I lived thru the S&P500 falling 5 points and I have the scars to prove it” was being whispered in hallways. Did you see ADBE today? It ripped 12% after they boosted guidance. Remember when everyone was up in arms about flash being excluded from the iPhone? Look what happened after that. Other winners were DHR, EVHC, ULTA, and MCK. Losers were UAL, GPC, HPE, and AAPL. Can we talk AAPL for a second because the same thing keeps happening year in and year out. AAPL does two things with their phones 1) they update the current one to be faster and 2) they completely rethink / redesign it. The iPhone 8 is the former and the iPhone X is the latter. You know what most people want? The redesigned one. So every time they do this the one that got a speed bump inevitably sees the following headline “iPhone meh falls on lower orders”. PEOPLE WANT THE NEW ONE, this shouldn’t be a surprise. Grrrr, now I’m angry. Also why does Boston Market still exist? You can buy a rotisserie chicken every five feet in my town and ex the Mac N Cheese their sides really aren’t that great. By lunch we say just shy of unchanged and I hope you enjoyed my correction story. We spent the rest of the day fighting and clawing for green numbers and with 20 seconds left succeeded! Boom! 2,562, +0.95 pts. 0.04%. Victory! Today was great, as a History major I love hearing stories about the past, especially crazy things like 20% drops in the market. If you have anything cool to share hit that reply button and tell me, I’d love to hear your experience. 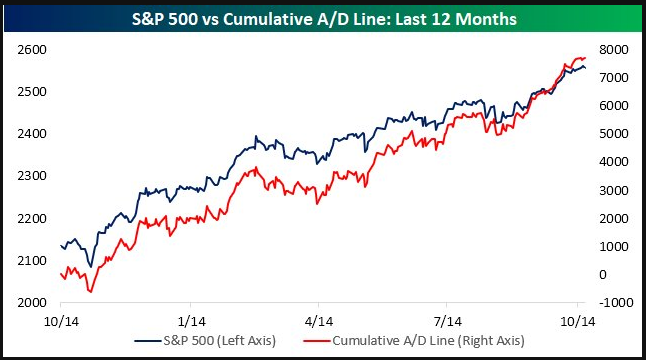 Before we head out into another glorious fall night I want to point you to one thing: The S&P500 cumulative A/D line is at an all-time high. It continues to expand, not contract. You just don’t see breadth expanding at a market top, there are almost always divergences that manifest before weakness. To me the bull market is still intact. You stink at Halloween costumes, trust me. You’ve been going as a Pirate or a Traffic cone for years, stop. Hit this link and keep it simple stupid. 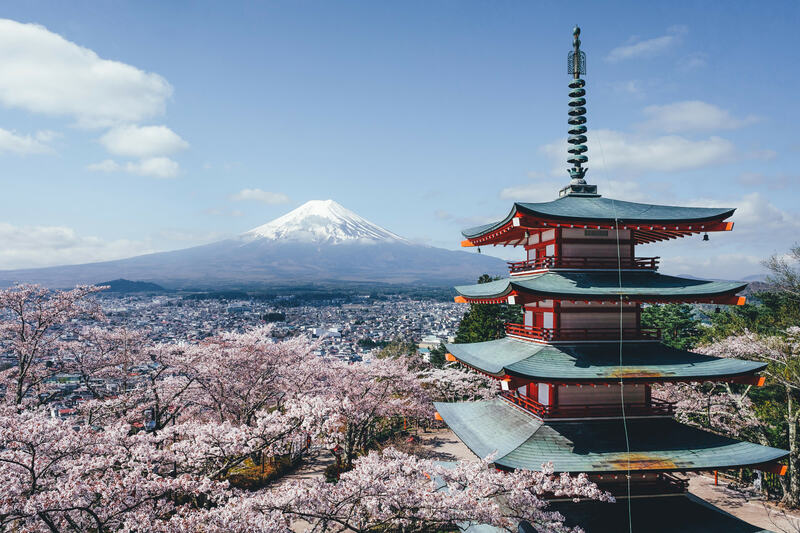 How to invest at All Time Highs: This one is simple…I like it: From a psychological standpoint, there are few strategies that work better than dollar cost averaging into a diversified portfolio of assets. This isn’t a strategy you can brag about to your friends, but making investment contributions at periodic intervals regardless of price is one of the simplest ways to avoid making mistakes or over-thinking investment decisions. We’ll end tonight with a guy who must be a BLAST to go drinking with. Life of the party and just so happens to be able to play a saxophone without a saxophone.